Opinions on conservation areas are split. Proponents would argue that conservation areas protect the visual appearance of historic neighbourhoods, by preventing owners from making changes that would be detrimental to character. Opponents would counter that this form of protection, in practice, means a severe restriction of property rights and, as a result, owners cannot adapt their homes to changing needs. For example, it is difficult to expand the living area after having children, e.g. by means of an attic extension, or to improve the energy efficiency by having new PVC windows. There is also a concern that such restrictions make the property less attractive to potential buyers, depreciating its market value. By the same logic, however, it can also be argued that the prospect of neighbourhood stability that comes with conservation area designation adds to the value of a location and increases the market value of properties located in the area. Theoretically, there could be a trade-off between the desire to preserve cultural heritage for future generations and current homeowners’ interests. However, whether the policy makes properties more or less attractive to homeowners today is an empirical issue that cannot be answered based on theoretical considerations alone. In a recent article, we analyse the causes and consequences of conservation area designation. To structure the problem and ensure that the empirical analysis is as transparent as possible, we develop a new formal political economy model whose predictions we then take to the data. The key idea is that residents with a taste for architectural distinctiveness stand to benefit from preservation, since it solves a coordination problem. The problem arises where individual homeowners make undesirable alterations to their properties or fail to keep them well-maintained. While removing a troublesome tree here or installing double-glazing windows there may make sense for an individual homeowner, such changes quickly destroy the character of the neighbourhood if everyone makes them. Therefore, if local homeowners like the character of their neighbourhood, it is worthwhile imposing strict regulation and maintenance obligations in the form of a conservation areas. Our model predicts that if homeowners are able to game the system, then neighbourhoods will be more likely to be designated in areas where residents have a greater preference for architectural amenities. Moreover, in terms of timing, designation is likely to happen in gentrifying neighbourhoods because the inflow of wealthy heritage-affine residents will make it more likely that the perceived benefits of designation exceed the costs of restricted property rights. Because conservation areas are designated as soon as they become worthwhile from the perspective of local owners (i.e. when the benefits have risen to equal the costs), the model predicts that no effect on prices of properties inside a conservation area will be associated with the incidence of a designation. However, there could be a positive price response outside the designated conservation area. This is because homeowners just outside a conservation area enjoy the benefits when passing through or looking at a protected area, without facing the cost of property rights restrictions. The empirical results are in line with the predictions from our theoretical model. We find that an increase in the number of affluent residents, and residents who hold a university degree, significantly increases the chances of an area being given conservation status. Concretely, a 1 per cent increase in the degree share is associated with an 11 per cent increase in the designated land share – a strong effect. Using more than a million property transactions from Nationwide Building society, we also find that the designation of conservation status has no immediate effect on properties prices inside conservation areas, but there is sometimes a positive price effect just outside. In analysing price effects, we control for various property characteristics (size, number of bathrooms, type of heating system, etc.) and compare the price trend inside to-be-designated conservation areas to other areas with similar characteristics that do not experience a change in designation status (a control group). Figure 1 demonstrates that there is no significant discontinuity in the price trend at the time of designation (year zero). If anything, there is an increased price growth over time. Notes: Figure shows the difference in ln prices adjusted for property attributes between areas to be designated (in year zero) and matched areas that do not experience a change in designation status. 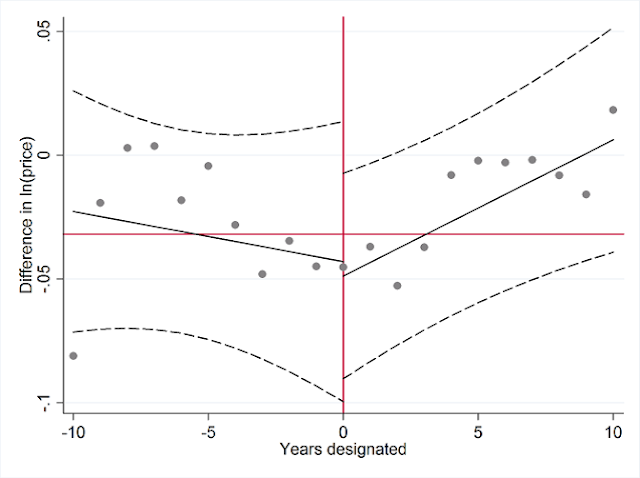 Dots denote differences by year, solid black lines are the linear predictions from a difference-in-difference regression model allowing for an impact of the policy on levels in trends, and dashed black lines are the 95% confidence intervals. Do these results support conservation area policies? Our findings suggest that the regulation helps homeowners solve a collective action problem, preventing some owners or landlords to freeride on others who invest in the historic housing stock. This means that the policy generally works in favour and not against the interests of local homeowners. It is not that current homeowners pay the price for preserving some heritage for future generations. Yet, the implications for society as a whole are less clear. There are benefits, e.g. to commuters or tourists living in other areas, and costs, e.g. due to limited supply of new housing and affordability problems for first-time buyers, to residents living outside conservation. Our results suggest that the system essentially delegates the decision of whether or not to designate a neighbourhood as a conservation area to local homeowners. While this is good for homeowners in the area, the downside is that the costs and benefits to residents living outside such areas are ignored. This blog post is based on the author’s paper Game of Zones: The Political Economy of Conservation Areas, co-authored with Kristoffer Moeller, Sevrin Waights and Nicolai Wendland, The Economic Journal, October 2017.